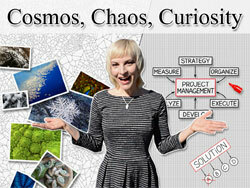 Click here to order Matter Over Mind: Cosmos, Chaos, and Curiosity from Amazon. It is hard to imagine humanity mastering reality and advancing gracefully into the future until we confront the internally inconsistent major philosophies of our time, both political and spiritual. Our current major philosophies—most of them at least—are outdated and confusing. If our youth aren’t confused, they should be. Let’s sweep up the broad misunderstandings between our most popular philosophies—the “left”, the “right”, the “spiritual”, and the “scientific”—and examine them closely, under a new lens. It’s my style to get down to the fundamentals, and I mean fundamental science; the way we have come to find that the natural world works. We can live solely through our loose, interpretive abstract thought, which does not reflect how the natural world works one iota, or we can learn to respect nature’s ways, and live in that mental place where logic and compassion are woven together in a robust partnership; one which will last us into many future millennia. I have written a book in order to help others learn to do the latter. The blogs on this site offer glimpses at some of the views in the book. Please leave comments with your thoughts so that we can begin an ongoing discussion, and together, form a new, reasonable, understandable, and compassionate philosophy that we can all live by. This site will be regularly updated and expanded, so be sure to keep visiting! Elaine, you continue to be amazing! It’s really refreshing to meet somebody who does not resign facing the ailments of our world, but has the audacity to start over. Indeed, dispensing with low-res labels to begin with is an excellent departure point! Yep. Not only are they low-res but are misleading because they are internally inconsistent. I just had a conversation with someone who said this. “Liberal means you do what you want. I’ll do what I want.” What he says is generally what ‘Libertarian’ means, not ‘Liberal’. Well sure, under a Liberal regime he can do what he wants in the bedroom, but not in his own home-grown business. Under a Conservative regime he could do what he wants in his home-grown business, but maybe not with his wedding vows. I’m completely intrigued with the topics discussed here. Does anyone know the release date for the book? I would love a physical copy! That’s great! I’m looking forward to the release and I’ll be sure to get a copy. Good luck to you! Update: It should either be out before Christmas or shortly thereafter. Hi Elaine, regarding the text, will you be writing as many do using “We” think this, and “We” do that, and “We” know this…? Hi David. I don’t ever state anything like “We think this”. The book is libertarian leaning, so I definitely put emphasis on individuals. Understood. Collectivism in language is a very important concept to grasp when learning new topics. I think a second, even more frustrating trend that one must grasp when newly learning science concepts and systems is Anthropomorphic treatment of natural processes. Best of skills in your treatment of both! I was reminded of this thread, namely, on the proper use of “we” at a lecture about the results in a human kinesiology trial, where I witnessed the use of the “condescending we”. This speaker consistently portrayed himself as being at one with both Academia as well as the audience members, by suggesting: “We know X. We value Y and Z. We cannot trust ourselves.” Ad nauseam. Click here to order Matter Over Mind: Cosmos, Chaos, and Curiosity on Amazon! The kickstarter kicked for $20K! Thanks to all who contributed and/or cheered me on! Have a look at one of the Kickstarter videos. Sign up for our email list to get updates about the book and be alerted when new content is added to this website.